“LARKIN-At 636 Center-av., July 4, JOHN P., the beloved son of Michael and Margaret Larkin (nee O’Hara), aged 3 years and 6 months. Funeral to Sag cemetery, Friday, July 6, at 9 a.m.
“SHAW-July 5, 1894, GEORGE, beloved son of John and Rose Shaw (nee Fox), aged 4 years. Funeral Saturday, July 7, at 9:20 a.m., by carriages to Mount Olivet from parents’ residence, 801 39th-st. The window was open, the curtains were drawn. A dove flew in and our darling was gone. 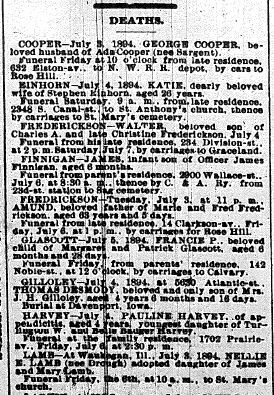 My transcription above is exactly as the notices appeared on page 5 of the July 5, 1894 issue of the Chicago Daily News with the exception of quotation marks at the beginning and end of each obituary. Abbreviations, capitalizations and references to people, places and things are indicative of the era in which this information was published. When possible, the deceased are also memorialized on Find A Grave. The emphasis on how the body was carried reminds me of the old movies where they show the funeral processions.